Ed Sheeran was born in Halifax, West Yorkshire and his family later moved to Framlingham in Suffolk. He sang in a church choir with his mother from the age of four. Sheeran's first guitar was given to him as a gift by his uncle. Ed initially taught himself, before going on to have proper music lessons. When Sheeran was 11 years old, he went to see Damian Rice perform an intimate gig in Ireland. Ed met the musician in a bar after the performance. Sheeran told The Telegraph meeting Rice convinced him to pursue music: "I had a little bit of a chat and kind of had an epiphany, like 'Wow, this is exactly what I want to do!' I got home that night and wrote a whole bunch of songs. I remember one was called 'Typical Average Teen.' Yeah, I was one of those." Sheeran remains a fan of the Irish singer-songwriter's music and has a tattoo of Damien Rice's name on his arm. Sheeran started recording music in 2005, and released the first of many EPs, The Orange Room, that same year. He moved to London at the age of 16. It was here he began to tour relentlessly, sleeping on fans' sofas every night after his gigs. Sheeran worked as a guitar tech for British folk duo, Nizopli. This soon lead to the band offering Ed an opening slot at their gigs. Ed Sheeran played a whopping 312 gigs in 2009! 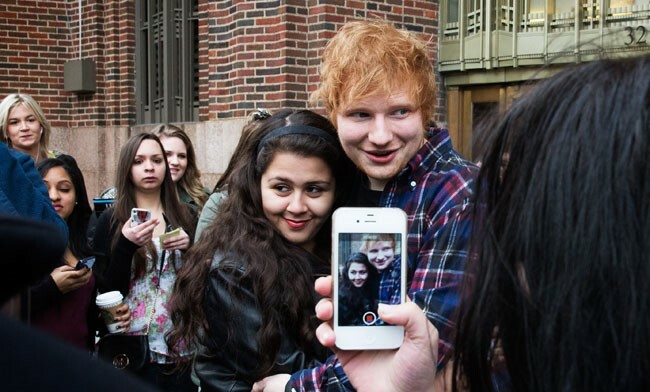 "I had Ed Sheeran sleep on my couch for six weeks. Before he made it, he came to my crib." The official video for Sheeran's single, "The A Team," cost just £20 (approximately $32) to make. In April 2011, Sheeran announced he would be playing a free show at The Barfly in Camden, London. Over 1000 fans turned up to the gig, prompting Sheeran to play four separate sets, including one on the street outside the venue after it had closed, so that everyone got to see him perform. On September 12th, 2011, Atlantic Records released Sheeran's debut studio album, +. Part of the LP - which reached #1 on the UK album chart - was recorded in a friend's garden shed, with Sheeran telling Q Magazine: "I wanted to keep that organic, lo-fi feel. I've got the rest of my life to make an album in a swish studio. This time round I wanted to stay true to the sound that's got me this far." Elton John is a big fan of Sheeran's music. In October 2011, Elton even convinced Sheeran to pose naked for a charity catalogue. Ed said at the time: "I'm not a very confident guy when it comes to taking clothes off. I've been persuaded for Elton John's charity to do a naked photo shoot. So ladies, lock up your daughters. I think it's all going to be part of a catalogue that's going to be sold to raise money. A lot of people are doing it." Sheeran opened up to Take 40 about his experiences with bullies at school and admitted it's made him the person he is today. "I think everyone goes through a bit of bullying at school. Of course you get picked on for certain things, but I think it ends up being a positive," he told the website. "I was quite a weird kid when I was little, I wore big glasses, had hearing problems, had a stutter and I had ginger hair, but I am now a successful musician and I have nothing to complain about. So I have come out the other end and blossomed." Ed struggles to relax when he's not performing. "I find it weird to have downtime," he confessed to Teen Vogue. "Before I was a musician, my downtime was music so now I'm like, 'What do I do with my time off?' My job is my hobby and my hobby is my job." Ed Sheeran on his upbringing: "Mum and Dad made sure they stimulated us rather than leaving us to our own devices. For years we didn't have terrestrial TV in our house. We didn't even have a TV license because my mum didn't want us to be sat in front of the TV all the time. We didn't own a video games console and I honestly think that was one of the best things my mum never did." "So all the time that my friends were playing Grand Theft Auto, I was sat there practising the guitar over and over and over again. To this day, I don't know what to do on an Xbox or a PlayStation." Ed Sheeran on the inspiration for his emotive tracks: "I write songs based on life experience. I write for myself and my music is raw and straight from the heart. Whenever I've written a sad song it's come from a painful experience that comes from a real place and usually I'll start writing within a few hours of that moment. All my music is deeply personal and I think it's good when you can just be yourself and not worry about what other people think." Ed Sheeran laid out all of his perceived flaws when he was a kid. "I was a very, very weird child. I had a port-wine stain birthmark on my face that I got lasered off when I was very young; one day, they forgot to put the anesthetic on, and ever since then, I had a stutter," he explained. "I also had very big, blue NHS glasses -NHS is the National Health Service, one day I hope you'll have the same! And I lacked an eardrum on one side of my ear, so stuttering was actually the least of my problems!" Ed Sheeran has a scar on his right cheek, which he claimed was the result of Princess Beatrice slicing him open with a ceremonial sword while pretending to knight singer-songwriter James Blunt. According to James Blunt, the whole story is fake. "Ed was drunk, messing around, and he cut himself," he told ShortList. "We made a fancy story up; people fell for it. It was very embarrassing." "I burst it when I was 18 and again I was 24. It's actually quite a common thing, so I wasn't worried. I only have about 25% hearing in that ear anyway." Ed Sheeran names his guitars after people in his working crew. Past guitars have been named Chris, Trev, James I, and James II. After the Grammy Awards in 2016, he embarked on an international journey with his girlfriend, Cherry Seaborn. Their first stop was Iceland, where impetuous Ed ignored instructions and wandered off path while touring a volcano. Ground gave way, and both of his feet were dipped in near-boiling water. When Cherry took one of his socks off, much of his skin came off with it. Sheeran was airlifted to a hospital, but instead of heading home, continued on with the trip, which also took him to Japan and Ghana.